Loft apartments often have large windows and exposed features. Despite the lofty, height-implying name, a loft apartment isn't necessarily in a high place. 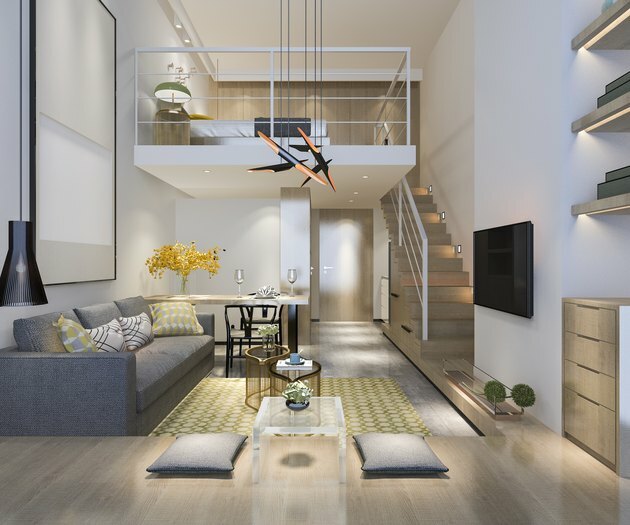 In real estate terms, it means an apartment featuring a wide open space with high ceilings and few (if any) interior walls, typically in a reclaimed warehouse or factory-style structure. A loft apartment almost always has high ceilings, dictated by the stripped-out building it's housed within. Other than the bathroom, lofts have open floor plans, often with exposed ductwork, pipes and bricks, giving them an industrial chic vibe. 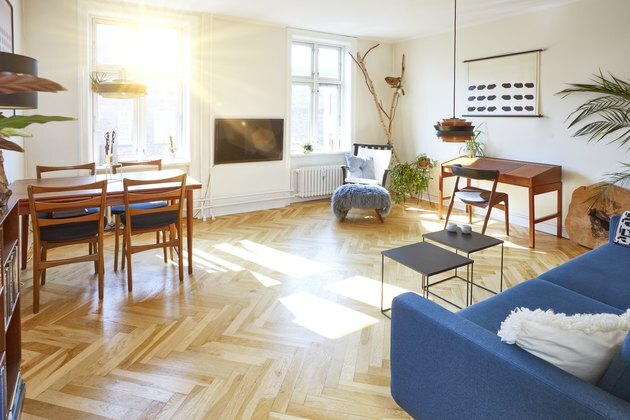 Vintage wood floors, still showing signs of wear from the building's original purpose, are desirable and common in a loft, although some lofts have concrete floors. Loft apartments also tend to be a bit more expensive than standard apartments of similar size, due to their desirability. In many cases, they're used as combined living and work or creative space—such as when the renter is an artist, dancer or clothing designer, for instance. Many lofts have large or even floor-to-ceiling windows and an abundance of natural light, which also makes them desirable. Typically, a loft apartment is rather large in square footage. Most loft apartments are in urban areas, thanks to the abundance of structures once used as factories, warehouses, storefronts and mills. In some cases, old office buildings may also be converted into a series of loft apartment units. 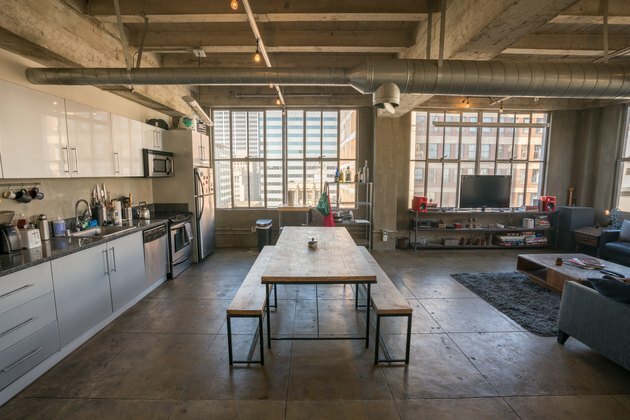 Lofts are often in close proximity to downtown workplaces, or near popular nightlife and restaurant destinations enjoyed by the post-college, pre-family-of-their-own crowd. A studio apartment is an all-in-one space. While both studios and loft apartments have fairly open floor plans, they're quite different from one another in other ways. A studio apartment is tiny in most cases, and much smaller than the average non-studio apartment. A studio is often just one open room, save for an attached compact bathroom. A tiny kitchen area may be connected to the larger open space that serves as both living room and bedroom. The unit may not even have a full-sized refrigerator and it likely lacks an oven, although it may have a cooktop and microwave. The features and appliances may be more like those in an RV, where every item is chosen for its small footprint since there's so little floor space available. Studio apartments can be found just about anywhere, from a spare room of a house to a small unit within an apartment building. Studios are usually less expensive to rent than other standard-sized units in the same building. A loft area may be within an apartment. Although not as common, some units marketed as "loft apartments" are really regular apartments that happen to have a higher, or lofted, room within. This type of loft space may have low or angled ceilings, useful primarily for lying down or sitting, not at all comfortable for standing. The upper loft area may be completely visible from elsewhere in the space, divided only by railings or a partial privacy wall. A space like this isn't typically rented out as an apartment on its own, but it may be listed as a bedroom for rent. It's also not the same as an attic apartment; a loft is always partially open to the space containing it. Apartments built above a garage area are also referred to by some as loft apartments, or garage loft apartments. In this case, access to the apartment may be from within the garage, or more commonly, by a separate stairway on the outside of the building. This type of unit may or may not have an open floor plan. In many cases, this type of apartment is added years after the garage is built, when a homeowner realizes there's useful space high above the area used to store vehicles and yard-maintenance gear. Some families build an apartment-style space into a garage as the building is constructed. City laws vary when it comes to the legality of renting out garage-loft apartments. Some families use the space for home offices or for bedrooms for teenagers wanting more privacy. What Is a 3-Bay Garage?